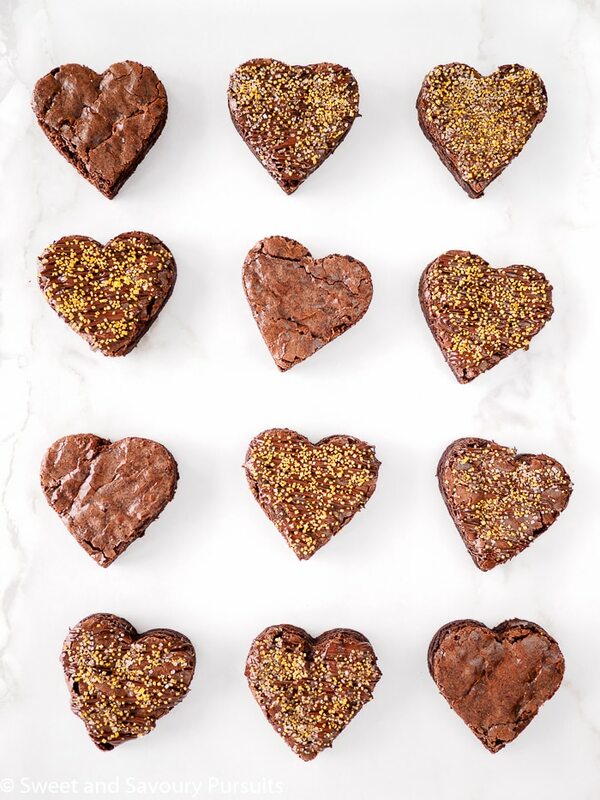 These made from scratch Spicy Chocolate Brownies are fudgy, rich, super chocolatey and spiced with a hint of cinnamon and cayenne. Did you know the Mayans and Aztecs commonly added chile peppers to their chocolate drinks? In fact, throughout history, many cultures used chile peppers as an aphrodisiac. So it seems perfectly fitting that for Valentine’s Day you would share a spiced chocolate concoction with your sweetheart! If you haven’t had the opportunity to taste a Mexican hot chocolate or a spicy chocolate bar, you really should try it, it’s delicious and the combination of spice and chocolate is rather addictive. 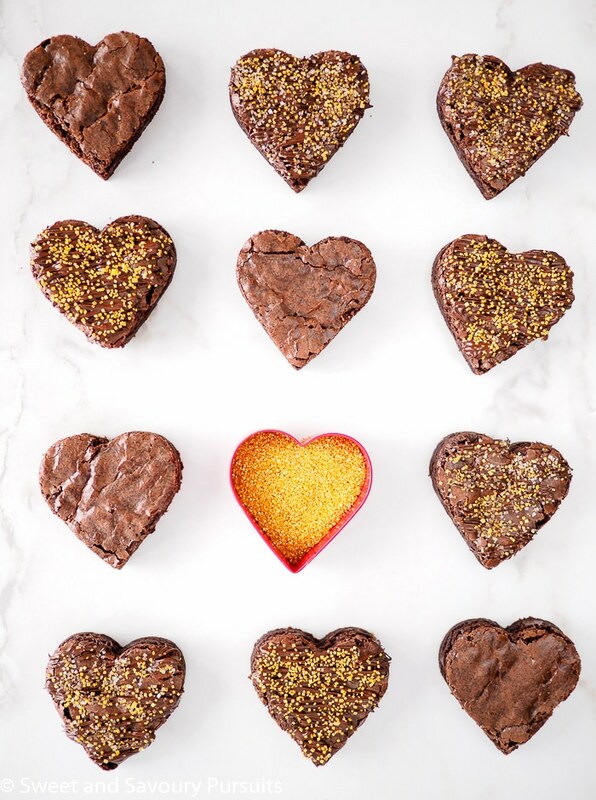 I wanted to use the combination of chocolate and spice in a baked form, so I made these Spicy Chocolate Brownies by adding cinnamon and cayenne to my favourite brownie recipe. The cayenne pepper adds a spicy savoury element and has a warming effect that we don’t normally experience with traditional brownies. The hint of heat is mostly detected at the end of your bite. If you prefer to make an un-spiced version of this brownie, you can simply leave the cinnamon and cayenne out. 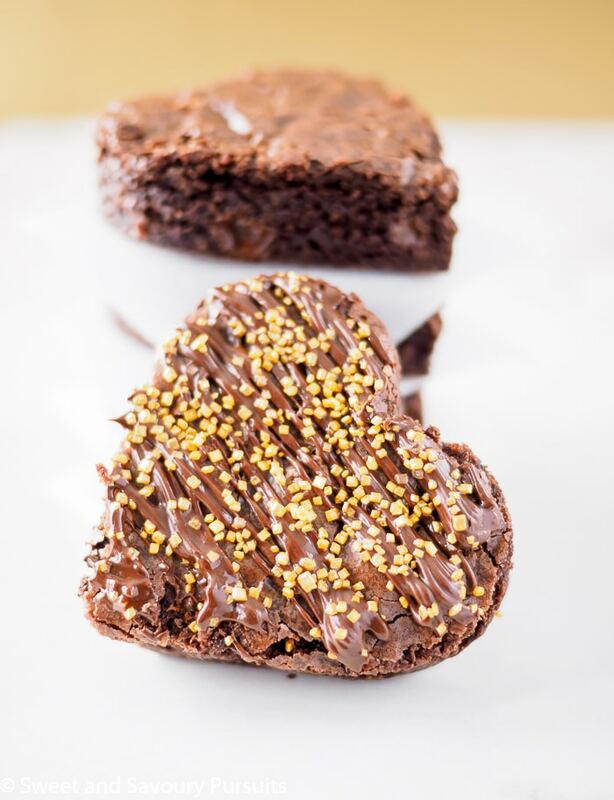 Which ever way you decide to make them, you can’t go wrong with this easy brownie recipe. I’ve made it several times now and the brownies always bake up so chewy with an intense chocolate flavour. No one can resist them! The original recipe comes from the Food Network, you can find it here. In case you’re having serious brownie cravings, and want to see more brownie recipes you’ll want to check out this recipe for Salted Caramel Chip Brownies. Enjoy! Grease and flour the bottom and sides of a 13x9-inch baking pan or line it with parchment paper. In a small saucepan, melt one cup of unsalted butter and let it cool to room temperature. In a medium bowl, combine the melted butter, sugar, eggs and vanilla extract. In another bowl whisk together flour, cocoa, cinnamon, cayenne, salt and baking powder. Add dry ingredients into the wet and stir until combined. Stir in the chocolate chips. Spread batter into the baking pan and bake for approximately 22-25 minutes or until a toothpick inserted in the centre comes out with a few crumbs. Let the brownies cool then use the overhang of the parchment paper to lift the brownies out of the pan. Using a cookie cutter of your choice, cut into shapes or simply cut into squares. Melt semi-sweet chocolate in microwave safe bowl in 15 second increments at 50% power, stirring chocolate in between. Pour the chocolate into a pastry bag (with Wilton tip #233) or small plastic bag (cut off a very tiny corner). 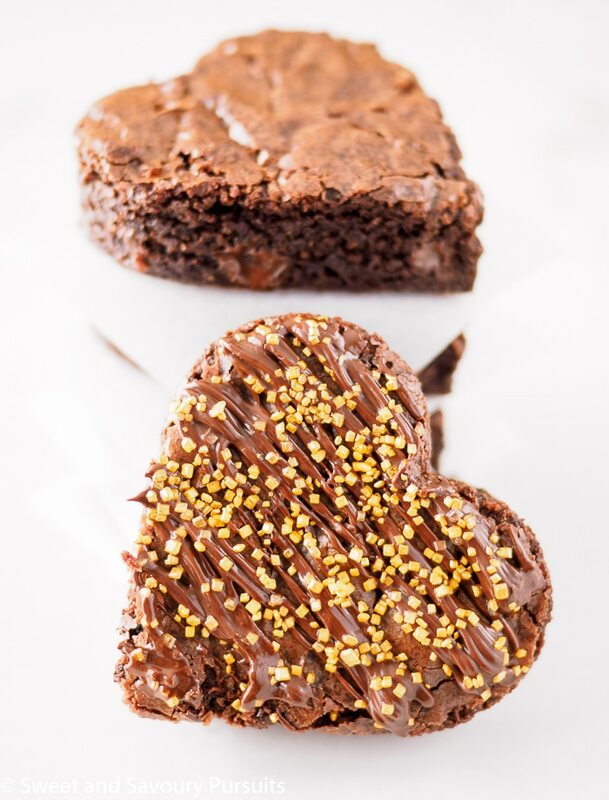 Drizzle the chocolate onto the brownies. If desired add coarse sugar or sprinkles while chocolate is still wet. Nutrition information doesn't include sprinkles. Ahh, thanks so much Karen! As a matter of fact I did know that about chili peppers! 🙂 I love this recipe and the heart shape is adorable! Thank you Annie, according to my kids you can never go wrong with hearts!